NOLA On Tap is the largest beer festival in the Gulf South. With over an attendance of over 25,000 people, the fest has live music, 400+ local, national & homebrewed beer, as well as a Homebrewers competition & People’s Choice Awards. It’s a dog friendly festival presented by the Louisiana SPCA and proceeds support homeless animals in the community. For NOLA On Tap 2018, I did an interactive mural on an 8’ x 8’ wall. The concept was a “Beer Lab” where I asked people what “far fetched flavor” their pet would like on tap. Some of the answers were so funny, some had adorable stories and some were inspired by quality bonding time under the tent while the rain passed. NOLA On Tap’s beer loving attendees loved to watch the mural come to life, contribute and have their picture taken through the day. 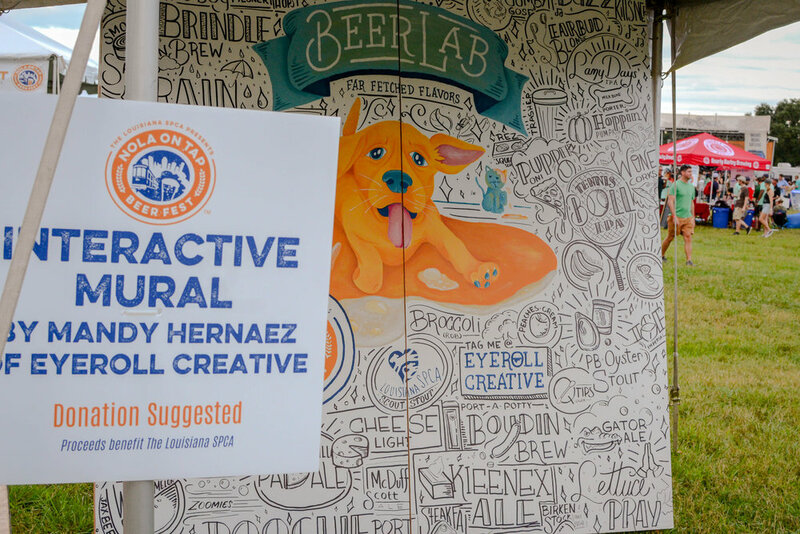 Not only did it provide the festival with user generated content, an interactive platform for their brand messaging and event art, but many guests wanted their picture taken by the mural and by their answers which were then shared on social media.